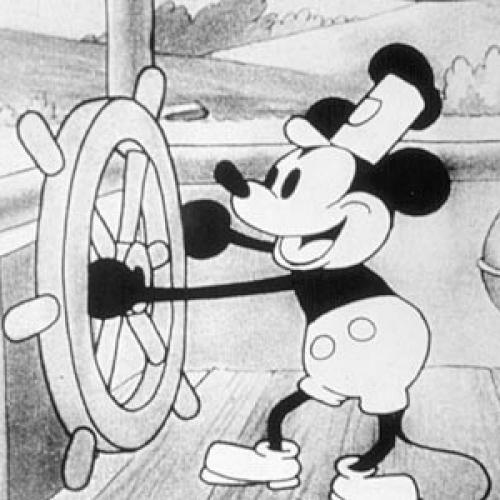 The success of Mickey Mouse is so great that it overshadows not only the competitors of Walt Disney in the field of animated comics, but Disney’s own more interesting work, the “Silly Symphonies.” Mickey Mouse is a movie comic of the first order, but I do not think its popularity depends entirely on its artistic merit; it has some of the element of a fad, where it joins the kewpie and the Teddy Bear, and I think because Mickey Mouse is a character, Disney finds himself forced occasionally to endow him with a verbal wit and to give him too much to say, which is against the spirit of the animated cartoon. The great satisfaction in the first animated cartoons was that they used sound properly—the sound was as unreal as the action; the eye and the ear were not at war with each other, one observing a fantasy, the other an actuality. The words of Mickey Mouse are still disguised as animal sounds, but the moment they are recognizable the perfection of the animated drawing is corrupted. This perfection can be observed in perhaps half a dozen of the “Silly Symphonies.” There was one called “Winter” (in a group of the four seasons) in which all sorts and sizes of furry animals watch the movements of the ground hog with anxiety and drive him back into his hole, while his disembodied shadow dances on the ground. In a dance of jubilation the rhythm of the movement and design made by the black and white figures on the screen are in perfect harmony. The music to which they dance is merely a guide to the rhythm. In “Busy Beavers” the ingenuity and the inventiveness of Disney are at their highest point. Here he reverses the favorite device of the animated cartoons. Instead of transforming steam rollers and telegraph poles into fantastic animal shapes, he transforms the beavers virtually into machines; annihilating time and material, they strip and fell trees and build dams at terrific speed, but always suggesting the sawmill, the axe and the lathe. In a symphony called “Egyptian Melodies,” he takes you inside the Sphinx and after a beautiful comic dance performed by mummies, the slaves, the soldiers, the high priests, the chariots on the walls suddenly come to life and in the grand climax all the hieroglyphics on two vast columns are animated in a dance of extraordinary excitement and beauty. These pictures are the perfection of the movie; they are the movie developing in its own field, borrowing not at all from inappropriate sources and transforming draftsmanship and musical composition to its own ends. They have reached the point toward which the photographed and dramatic moving picture should be tending, in which, as in the silent pictures, everything possible is expressed in movement and the sound is used for support and clarification and for contrast. Disney’s nearest rival with whose work I am acquainted is Max Fleischer, and the best of his cartoons is one called “Sky Scraping,” in which a variety of animals carry the skeleton of a building beyond the crescent of the moon and desert it at the five o’clock whistle. The “plots” of drawn comics are seldom more complicated than this and that is another point in which the regular movie might take a lesson from them. I remember seeing this picture first on the same program with one of Harold Lloyd’s early talking pictures and was struck by the immense superiority of the simpler form. You see two animal hodcarriers walk rhythmically along a steel beam; they are stepping off into space when a derrick swings another beam at right angles under their feet, and this continues until, having established your confidence, the artist omits the saving beam the last time and the two little beasts walk off unconcernedly into thin air. Red-hot rivets are used for golf balls and flatten themselves (the Anvil Chorus assisting) into their appointed places. And when the detail has been sufficiently shown, the skyscraper is thrown into a long shot and projects itself with enchanting rapidity, floor by floor, into the heavens. Out of hundreds of animated cartoons, I can recall only two or three which were wholly bad; even the imitative ones and those lacking in ingenuity gave some sort of pleasure. This suggests that something in the form itself is a satisfaction to us. And that satisfaction, I think, is the childish one which the movie as a whole had in its beginning and which long custom and the injection of dialogue has taken away from the photographed drama. It is our pleasure in magic, in seeing the impossible happen. (The movies have also given us the pleasure of recognition in the newsreel, where we see what has actually happened, happen again.) In the early days we looked at a movie and marveled that a picture could be set into motion. Now we do not think of the picture—only of the actors. The animated cartoon shows us in movement something naturally inert, and it is essentially the satisfaction of magic that we get out of it. Magic—not illusion. I cannot follow the admirers of Disney who attach a profound significance to his contemptuous handling of the Great God Machine. If the animated cartoon created illusion, you might take it as criticism, psychological rebellion and release from the tyranny of things. It remains a plaything, and in a very rudimentary form existed before the terror of the Machine Age set in. Mr. Terry Ramsaye notes, in his history of the moving pictures, that in China and Java silhouettes are cast in shadowy dramas against a screen and these are part of ancient folk plays. The contemporary animated cartoon uses machinery for the same simple process. On the other hand, the perfection of this form is an American achievement and is bound to have some American qualities. It has no emotion in its comedy; it is repetitious (the reiteration of the musical, dance and chase motifs almost standardize the pattern); it is impertinent; it is genuinely gay. And it strikes me that nothing is so much to the credit of the American movie public as the tribute it instinctively pays to the very best things the movie has done. I do not think I have ever seen an animated cartoon which at least half of the audience has not applauded at the end. This may not be true in the cathedrals and palaces of the talkies, but these real-estate operations are rapidly becoming the last place in which one can judge either the movies or their audiences. This article originally ran in the June 8, 1932, issue of the magazine.